Last Wednesday, our general members were treated to a visit by two very important alumni, Kapil Melkote and Matthew Kaido. Kapil, co-founder and first president of CCWA, gave a presentation to our members on the original idea for the organization: a club with an academic focus, as well as a social component— or “the most inclusive fraternity ever.” Kapil detailed how he and other founding members were able to grow the club in the span of a few years, with CCWA receiving the “Outstanding Student Organization Program” in 2012. In some respects, the Ohio State that Kapil described seemed like a completely different school from the one we attend now— the Ohio Union and Thompson Library were still under construction in 2011, and the school year ran on quarters instead of semesters. However, the CCWA that Kapil described sounded strikingly familiar, from the persistence of traditions like jam sessions and shrunkmuncs to OSUMUN, a CCWA tradition that Kapil and his friends helped create. 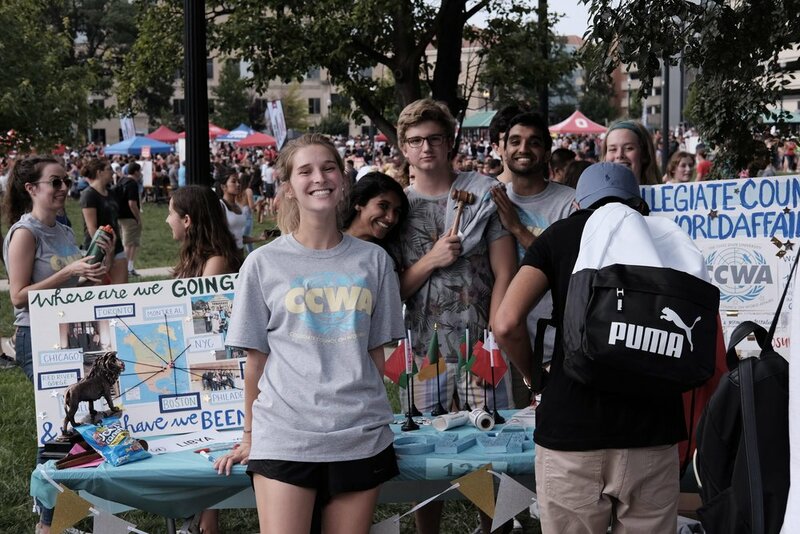 More than anything, Kapil and Matt were able to speak to what makes CCWA so special— the relationships we make in this organization that make Ohio State, a school of over 40,000 students, feel small and that continue long past graduation day. On behalf of our current members, I would like to extend a sincere “thank you” to Kapil and Matt for taking the time to speak with us. We look forward to strengthening our connection with CCWA’s amazing alumni network, and hosting alums this coming fall for Homecoming weekend (October 4-6th)! But beyond the competition and awards, PUNC continues to be a place where delegates can connect with other hard working MUNners and international affairs aficionados, and to make friendships that persist across the collegiate circuit, all coming together to make a truly memorable conference experience. PUNC is a staple of the CCWA conference circuit, and Head Delegates Abi McGowan and Piper Womelsdorf would like to extend their thanks to Penn State’s International Affairs and Debate Association (PSIADA) for their hard work in organizing what is consistently one of CCWA’s favorite conferences. We’ll see you next year, PUNC! CCWA braced the cold at the North American Model United Nations conference (NAMUN) in Toronto. NAMUN boasts the title of Canada’s oldest university-level Model United Nations conference, though for CCWA-ers, this conference was a first. Delegates faced many challenges in committee, and worked hard to address crises such as election fraud, Communist uprisings, assassination attempts, and more, in addition to the real life crisis of driving home through a New York blizzard and 75 mph wind. The team also enjoyed the Harry Potter-esque architecture of the University of Toronto’s campus, and exploring metropolitan Toronto- the 4th largest city in North America. The team ended the weekend triumphantly taking home the award for Best Small Delegation as well as several individual awards: Kathleen Fink was awarded Honorable Mention for her representation of the United Kingdom in DISEC, Anthony Perrins received the award for Outstanding Delegate for his position as Iraq in the UN Security Council, Yazan Anani was awarded Best Delegate for his performance in the National Provisional Ruling Council, and Piper Womelsdorf received the award for Best Delegate in the America 2024 United States Senate. We are so proud of everyone who joined us for CCWA’s first time at NAMUN, and are looking forward to adding this conference to our repertoire. See you next year, Toronto! Election season is upon us… and no, not just for USG. It’s also time for the annual CCWA elections! 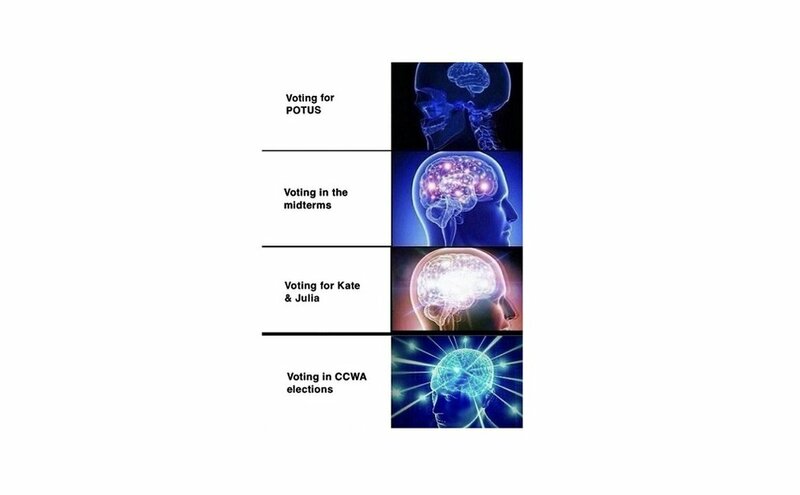 This year, CCWA is implementing a new voting system with the hopes of attaining a more accurate and legitimate representation of the CCWA electorate. As per a recently passed amendment to our club constitution, we will now be using a rank choice system, in which each voter will be able to rank the candidates for every position on the ballot. A shift away from our previous plurality vote process, the rank choice system is intended to produce winning candidates that a larger number of voters agree upon. Speaking of candidates, we have a huge variety of fantastic people running for positions on the CCWA Executive Board, Internal Affairs Committee, and External Affairs Committee. Particularly contentious races include those for Vice President, Director of Outreach, and Marketing Chair. Meanwhile, some other races might turn out to be landslides, such as in the Presidential race where Abi McGowan currently runs unopposed. But keep in mind: CCWA members are allowed to nominate candidates up until the time of elections. Polls posted today on the CCWA Voting Members Facebook page will determine what two questions will be asked to the candidates of each position. Be sure to vote in the polls and come to tonight’s meeting to hear the candidates’ responses! It’s time to perform your civic duty CCWA-style! This weekend, our team heads back to the Great White North to conquer yet another conference: NAMUN. Held at the University of Toronto, NAMUN is Canada’s oldest university-level Model United Nations Conference. This year, NAMUN will feature a number of different committees, such as Stalin’s Politburo and a crisis committee centered on the 2024 US elections following the hypothetical re-election of Donald Trump. Although smaller in scale than the last Canadian conference we attended, our team is fully expecting fierce competition, beautiful city life, and, of course, an overall MUNderful time. 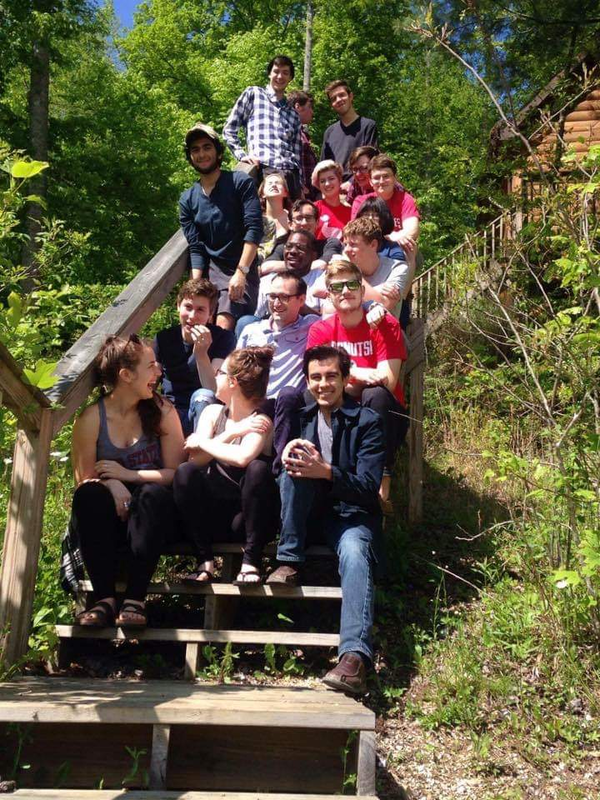 The CCWA team representing Ohio State in Toronto includes Piper Womelsdorf, Faraz Ansari, Maddy Fixler, Anthony Perrins, and several other highly qualified MUN-ers. Meanwhile, back in Columbus, CCWA is gearing up for another much anticipated Model UN Conference: OSUMUN. Unlike NAMUN, OSUMUN is a high school level conference and is completely run by CCWA. OSUMUN will feature eight different crisis committees and two General Assembly committees. The crisis committees will be centered on a variety of different topics, spanning the history of the world. The GA’s, on the other hand, will be focused on the work of the UN Office on Counter Terrorism and the UN Development Programme. Aside from the newly created committee topics for this year, the OSUMUN Secretariat is particularly excited to introduce OSUMUN t-shirts for the delegates and staffers. OSUMUN will be held April 5-7. As of now, background guides have been uploaded onto the OSUMUN website, staffers have been assigned to their committees, and registration has closed for most schools. All that’s left to do is train and prepare the staffers before the conference. If you don’t know what your staffing position is or don’t have one and would like to help, contact Secretary-General Sasha Zborovsky immediately. OSUMUN is the biggest event that CCWA hosts and needs as many hands as we can get. So let’s get to work and make this our best OSUMUN yet! Special Announcement: The Executive Board and OSUMUN Secretariat would like to congratulate Vince Glidden on being selected as next year’s Secretary General for the OSUMUN conference. This weekend members invited their parents to Harvest Pizzeria in Columbus to introduce their blood relatives to their “family away from home.” President Sam Taglia provided a taste of a general member meeting, with Charles Woodrum giving a CCWA10 on the ethical considerations of gene editing and how the international community should respond and regulate scientific research such as the CRISPR babies recently born in China. Parents introduced themselves as new members usually do, sharing their favorite international affairs topic and answering the perennial question of whether they would rather fight one horse-sized duck or one hundred duck-sized horses. Parents overwhelmingly would prefer one-hundred duck-sized horses, Anya Chew’s mom answered that she would befriend the little horses and make money selling them. The night was a great opportunity to share what the Collegiate Council on World Affairs means to us, and we’re incredibly grateful to all of the parents who support us. A special thank you goes out to Kathleen Fink and Piper Womelsdorf, who organized this amazing event! In many delegates’ eyes, the most MUNderful time of the year is late January, when thousands of college students travel to Montreal for McGill University’s McMUN. The thirtieth iteration of the conference did not disappoint, with intellectually stimulating debate on global issues being the hallmark of every committee. CCWA brought twelve delegates to spend the weekend debating in competitive General Assemblies and Specialized Agencies, nabbing two Outstanding Delegation/Delegate Awards in the process. Sam Taglia won the award in the Ad Hoc committee as “Alexa Echo,” and Vince Glidden and Mack Hogan were awarded Outstanding Delegation representing Egypt in the Economic and Financial Committee of the UN. Other delegates participated in the UN Permanent Forum on Indigenous Issues; UN Oceans; World Anti-Doping Agency; the Baltic Assembly; US Congress; Royal Commission on the Status of Women; and the Social, Cultural, and Humanitarian Issues Committee of the General Assembly. Our delegation is incredibly proud of our performance at one of the largest and most competitive conferences on the North American circuit, and we look forward to continuing that success at NAMUN in a few weeks. Vive la France!... and French-Canada! This past Monday, we held our first internal “shrunkmunc” of Spring semester and word on the street is that it was très magnifique! The shrunkmunc was a Crisis committee centered on the French Revolution and included all your favorite figures from the era, like Robespierre (Sasha Zborovsky) and King Louis XVI, but with your classic Crisis twists. This time around, the King was found innocent at his trial and was ultimately spared from the guillotine. 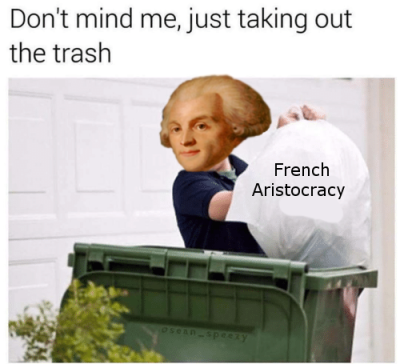 Robespierre, on the other hand, wasn’t as lucky to escape his historically accurate fate. But the culmination of tragedy occurred with the death of Marat (Matt Schwamberger), who perished in a classic case of poisoned ointment. Terror, needless to say, reigned on our delegation. In other MUN-related, but only somewhat less French news, CCWA is headed to Montreal! 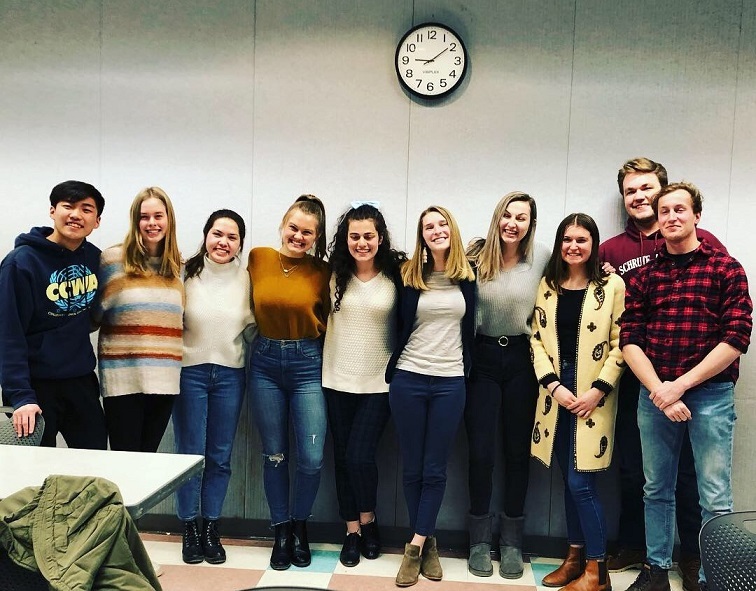 Our organization has assembled a team of some of our finest Model UN-ers to compete at McMUN, the largest Model United Nations conference in Canada. Among those competing are our very own Sam Taglia, Abi McGowan, Anya Chew, and Vince Glidden. Hosted by McGill University, McMUN will feature a variety of competitive committees, ranging from GAs on sustainable development goals to a Crisis committee on the Marvel nation of Wakanda. The conference will be held this weekend, from January 24th to the 27th. My name is Lizzy Roka and I’m a first year at The Ohio State University. 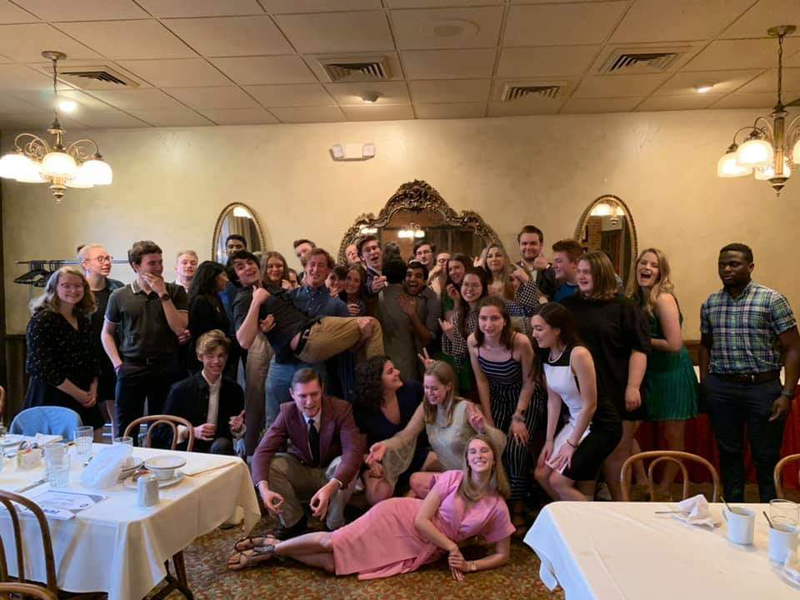 I joined CCWA last semester and have since participated in a handful of our internal “Shrunkmuncs,” been elected as the Director of Social Events of UNA, and even attended Boston University’s Model United Nations Conference this past fall. But finally, as you could have guessed, I’ve been asked to head the Blog on our newly finished website! So if you have any suggestions or questions on anything Blog-related, I’m your girl. On this Blog, we’re planning to cover a variety of different club-related topics, ranging from updates on our team performance at MUN conferences to personal accounts of different membership events we’ll be having throughout Spring semester. In the next coming weeks, you can expect to learn lots about our preparation for the highly anticipated, highly competitive McMUN tournament and how to get involved with our fast approaching OSUMUN conference. P.S. To all members who just can’t get enough CCWA and want to write about it, we would love to have your voice heard on the Blog. If you want to start writing, please feel free to contact me or Executive Secretary Simon Pollayil.